Living in Battle Ground, I’m fortunate to unwittingly be at the heart of the vineyard action in Clark County and I’m anticipating that newcomers, Rezabek Vineyards/Daybreak Cellars, will have their tasting room (less than four miles north of me) up and running for all to enjoy in 2015. Until then, they are an appointment-only vineyard but I met up with co-owners Roger Rezabek and Donna Anderson, in the historic pump house of English Estate Winery during the Clark County Wine Country Thanksgiving. Let me start by saying I love their labels. Donna shared with me that they’re all from photos taken around their property including the stained glass one on the 2012 Pinot Noir (a piece owned by them). The next thing I have to share is that Roger is growing pinot meunier (pee-no moon-yay) grapes on his planned-to-be four acre vineyard site. With this addition he has all the makings for sparkling wine of the Champagne variety and, if he’s successful, what a coup for the Couve (sort of) to have stake in a sparkling cuvée (I know it’s a stretch but it was too clever not to use). Here’s my take on their current six-wine lineup. 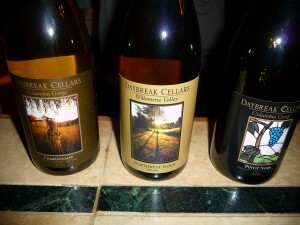 Daybreak Cellars’ 2013 Chardonnay had no detectable oak with plenty of green apple and a bit of pear on the palate similar in style to a Chablis. Grapes are sourced from White Salmon Vineyards and its refreshing acidity would lend nicely to an aged cheese plate, shellfish or turkey. Northwest Gold was Rezabek Vineyards’ crowd favorite at the 2nd annual Craft Winefest held at Esther Short Park back in June. This Willamette Valley-sourced white blend of Riesling and Pinot Gris is certainly on the sweeter side which always makes me think of a well-chilled aperitif on a hot summer day. Less rain to damage plump grapes at harvest time made 2012 a top-notch year for growers and this Pheasant Valley Pinot Noir shows lovely red fruit, a hint of oak and pleasant medium tannins making it safe to pair more boldly with red meats than a lighter-bodied pinot. Speaking of, the 2009 Pinot Noir is the lighter-bodied version elegant version that pinot fans may be more familiar with. Its nose gracefully hints of rose blossom and an earthy quality with some blueberry characteristics putting it spot on with the vintner’s suggestion of salmon and pork. The food-loving reputation of tempranillo did not disappoint with Daybreak Cellars’ 2012 vintage from the Columbia Valley. The heat of eastern Washington is evident in this full-bodied beauty with hints of coconut on the finish. Tempranillo being king in the Rioja region, I pull from my recent experience in Spain where pork hangs from every ceiling and is served all manner of ways as well as paella or red meat. My favorite of the tasting was, hands down, the 2009 Cabernet Franc/Merlot blend. Rezabek dug deep (or south) for Rogue Valley grapes and the proof of what that area is capable of is in the bottle. I can sip this or pair it with food which is my favorite kind of wine; versatile and accommodating. I could write my own notes but Roger and Donna’s description was exactly what I detected “blackberry, plum, and green pepper.” The cab franc elevates this to higher-end meats while the 40 percent Merlot allows it to be just as pleasing with every day meals like spaghetti or backyard barbecue. 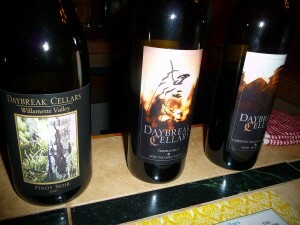 Rezabek Vineyards is located at 11700 NE 279th St, Battle Ground, WA 98604. For a private tasting, call (360) 896-0218. **If you like what you’re reading, follow Corks & Forks by clicking the ‘Follow’ button on the bottom right-hand corner or follow Corks & Forks (News/Media Website) on Facebook.